My husband and I often joke that asking someone what size babies run in their family should be a common first date question. So the conversation could roll from Where do you work? to What do you do in your spare time? to So, would you say that you were an overly large baby, by chance? Sure, it would be a little awkward, but then it could save couples from the point 10 years later when the wife is pregnant with her first child and finds out that, thanks to her husband's genes, this baby is going to be over 10 pounds. Let's just say that she won't be too happy about it. Let's also just say that the actual process of giving birth to said 10 pound, 5 ounce baby (and her future nearly-10 pound sister) aren't experiences that she would want to relive. Nonetheless, no matter the size or the process in which a baby comes into the world, it is a moment that will never be forgotten. So how do you mark a life-changing occasion such as this? While cards, flowers and baby clothes are always options, finding something symbolic and worthy enough is not an easy task. After all, we're talking about the birth of a child here! 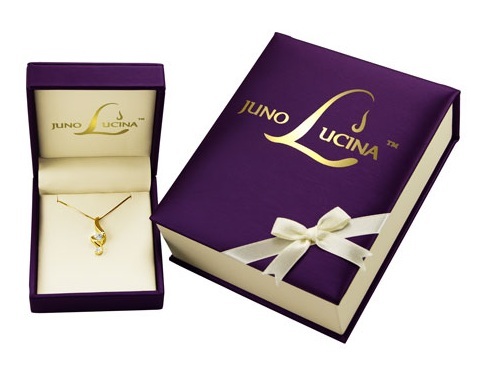 Fortunately, there is a brand that realizes just how important this moment is and what it takes to commemorate it: Juno Lucina and the Juno Lucina Signature Pendant. Juno Lucina believes that giving birth is one of the most memorable moments in a woman's life and if a loved one is going to give the perfect gift that it should be just as meaningful. Therefore, they didn't just create their stunning, 14-karat gold and diamond pendant to look beautiful, they wanted it to carry on the symbolic meaning that has existed for more than 1,000 years. Based on the symbolization of the Roman goddess of childbirth's hands cradling the heads of mother and child, this Signature Pendant is a perfect push gift from a spouse, partner, family member or friend to the new mom in their life. I can't think of a way for a new father to demonstrate his deep appreciation for his partner's experience of pregnancy and birth and how she has forever changed his life! While I thought that the images of the Juno Lucina Signature Pendant (available in white or yellow gold) looked great online, I couldn't wait to see it in person. When the padded purple box arrived, I had to admire the way that this company knows how to do an amazing presentation. Inside the outer box, I found a smaller jewelry box containing the pendant as well as a poem to the new mother. While just receiving this piece is a great gift, having the written words there reinforcing the symbolic meaning behind it and reiterating that it is to safeguard and protect the mother and child in the journey ahead is extremely heartwarming. While other jewelry companies divide their time making rings, earrings and necklaces of all kinds, Juno Lucina has always put all of their effort and work into only their Signature Collection and the importance behind the singular moment of birth. Which is why I should have been more prepared for just how dazzled I was when I opened the smaller jewelry box and found the luxurious quality of the 14 karat gold and natural diamonds perfectly matched together. 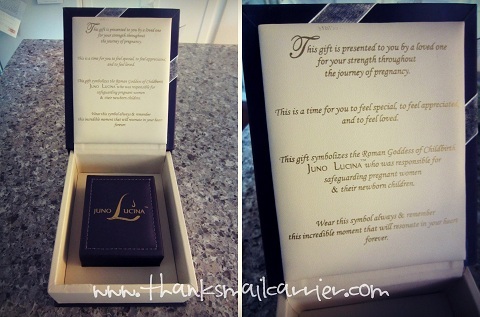 When it comes to marking the incredible moment of having a child, Juno Lucina has created a gift that is truly worthy of that occasion. Not only will you find a top quality piece (made in America) that symbolizes the magnitude of the occasion, but the complete experience of being a customer is miles away from what you'll find elsewhere. Juno Lucina is committed to providing only the very best service and being available for any question or purchasing need. No matter if you purchase this pendant in 1/10ctw for $299 or 1/2ctw for $1,299, you'll receive their custom couture concierge white glove one-on-one service that ensures that the process will be easy and comfortable. While there are hundreds of jewelry options online, the jewelry from Juno Lucina was created for one moment and one moment only... and their incredible service makes them stand out from the crowd. 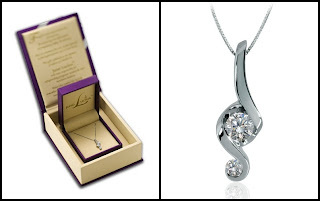 When it comes to presenting this gift to a loved one to tell her that this moment is greater than just any special occasion, she is sure to be blown away and appreciate the thought and meaning. in white gold! ARV $299! 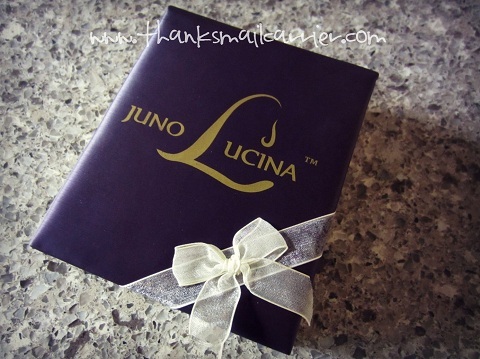 A big thank you to Juno Lucina for providing a Signature Pendant for me to review as well as for one lucky giveaway winner. The opinions shared are my own and honest and if you really need to see more, click here to see how I roll. All designs symbolize the hands of Juno Lucina®, the Roman Goddess of Childbirth, cradling and protecting the head of both mother and child. Juno Lucina, the Roman goddess of childbirth, safeguarded mothers and their newborn children. Theology states that she was invoked during childbirth for both an easy delivery and the promise of a healthy child. The name Lucina, of Latin origins meaning light, refers to "she who brings children into the light of the world for the first time." Juno Lucina is the Roman Goddess of Childbirth. All designs symbolize the hands of Juno Lucina, the Roman Goddess of Childbirth, cradling and protecting the head of both mother and child. I had never heard of a push present before. I too birthed a 10lb 9oz baby boy and prior to him, a 9lb 10oz boy. I learned all about this amazing gift while reading their website. I now know that Juno Lucina is the Roman Goddess of Childbirth. I also learned that even a close friend could give this gift to a new Mom. The luxurious design symbolizes the hands of Juno Lucina®, the Roman goddess of childbirth, cradling and protecting the head of both mother and child. I learned that the name Lucina, of Latin origins meaning light, refers to "she who brings children into the light of the world for the first time." 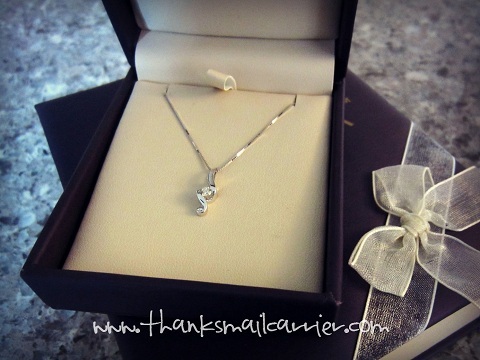 I learned that it is the only luxury push present with a true historic and symbolic meaning! I learned that his pieces resemble hands from the goddess of childbirth. I learned that all designs symbolize the hands of Juno Lucina®, the Roman Goddess of Childbirth. I learned on their blog that they are trying to decide whether to change the name from a push present to a birthing gift. I love these pieces!! I learned Juno Lucina, the Roman goddess of childbirth, safeguarded mothers and their newborn children. I learned what a push present was! I had no idea about these, but I think it's a beautiful concept!! I would have loved to be presented with one of these beautiful works of art after delivering my first son. Lucina is the Roman goddess of childbirth. Her name means she who brings a child into the first light. I learned that The Couture Collection starts at $4,999 and is customly made to impress. I learned The name Lucina, is of Latin origins and means light, refers to "she who brings children into the light of the world for the first time." There's a 5% off promo code!! I LEARNED THAT THE NAME LUCINA, IS LATIN & MEANS LIGHT. this absolutely cracks me up- that there's an entire website and company dedicated to push presents! I have never heard of such a thing. I learned Juno Lucina has been the original symbol of childbirth for over 1000 years. I learned their goal is to create more than just stunning jewelry, it is to create a memory that will live forever. I learned that in ancient times, as was the custom, men presented their woman with a gift in commemoration of Juno Lucina who protected both mother and newborn in their journey ahead. I learned that Lucinda is the goddess of childbirth. I learned that it is the only luxury jewelry design with a true historic and symbolic meaning, now that's pretty unbelievable. I learned that Juno Lucina, the Roman goddess of childbirth, safeguarded mothers and their newborn children. Thanks so much. 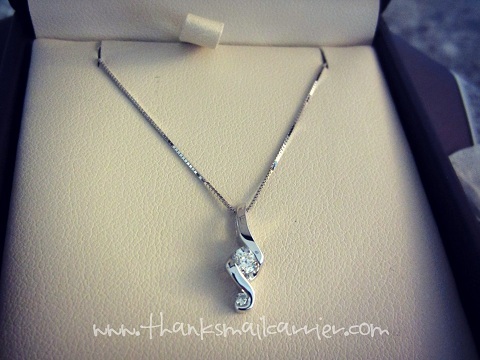 This is such a beautiful necklace. I learned that the symbol of Juno Lucina has been around for a thousand years. I learned that 1,000 years ago, the Roman Goddess Juno Lucina was customarily called upon to protect pregnant mothers on their journey through pregnancy. Today, the Juno Lucina Collection allows one to present the mother with a spectacular piece of jewelry whose design symbolizes the ancient tradition of Juno Lucina’s arms cradling the heads of mother and newborn. I learned that they currently have a 5% off promo code. I learned that a "push gift" doesn't have to be from the father of the child, but can be from any loved one who wishes to express their gratitude. I learned that all of Juno Lucina designs symbolize the hands of Juno Lucina, the Roman Goddess of Childbirth, cradling and protecting the head of both mother and child. I learned that Juno Lucina is the Roman goddess of childbirth. I like the signature drops. learned: Juno Lucina, the Roman goddess of childbirth, safeguarded mothers and their newborn children. They have 30 years of experience In the creation of luxury jewelry! I learned that Luciana means she who brings children into the light of the world for the first time. The symbol is ancient and been around for a 1,000 years! Juno Lucina, the Roman goddess of childbirth, safeguarded mothers and their newborn children. Love their beautiful boxing that makes for a great presentation! The name Lucina, of Latin origins meaning light, refers to "she who brings children into the light of the world for the first time. I learned they have a risk free 90 day return policy. It's the only jewelry line that has a symbolic and historic meaning. I just realized that the movie Juno was actually clever in naming their main character after a goddess of childbirth. Ahh, I get it now. All designs symbolize the hands of Juno Lucina®, the Roman Goddess of Childbirth, cradling and protecting the head of both mother and child. This silhouette delicately represented in every piece maintains a timeless beauty and elegant feel. I learned that they have 30 years of experience in the creation of luxury jewelry. I learned that the name Lucina, of Latin origins meaning light, refers to "she who brings children into the light of the world for the first time. I also learned more about push presents, which I had never heard of. A push gift is for a new mother. I learned that all designs symbolize the hands of Juno Lucina®, the Roman Goddess of Childbirth, cradling and protecting the head of both mother and child. Their story is imprinted on every jewelry box. I learned that all their designs symbolize the hands of Juno Lucina, the Roman Goddess of Childbirth, cradling and protecting the head of both mother and child. I think that's lovely! I learned that they offer free 2nd day FedEx shipping. The romantic inscription on every box describes the moment perfectly! I learned the company has been in business over 30 years. I learned Juno Lucina is the Roman Goddess of childbirth. I learned that the symbol of Juno Lucina has been around for a thousand years as has the concept of a push gift. i learned they have risk free 90 day return...although who wouldn't be happy with one of their items?! I learned "All designs symbolize the hands of Juno Lucina®, the Roman Goddess of Childbirth, cradling and protecting the head of both mother and child"
I learned that a "push gift" is traditionally given to a new mother at the hospital after the birth or when she returns home but may be given to her prior anytime within the third trimester. I learned that Juno Lucina has free 2nd day shipping from FedEx. I learned the name Lucina, of Latin origins meaning light, refers to "she who brings children into the light of the world for the first time." I've heard of the concept of giving a gift to a new mom (of course, who hasn't! ), but i had no idea that it was called a push gift...i love the idea! I learned That Juno Lucina is the Roman god for child birth. I learned that the Couture Collection starts at $4,999. I found out that it's a risk free 90 day policy. It is the original symbol of childbirth. they symbolize the roman goddess of childbirth... interesting. I did not know this was a gift given to expectant mothers. That is cool idea. First of all, I totally love the story behind their jewelry! But, I was also excited to see that they will help make custom pieces. I learned that this symbolizes mother and child. It is the perfect gift for an expecting mom. Ooh they have a 5% off coupon! family member but is also ideal from a loving friend. I had never heard that term before. All designs symbolize the hands of Juno Lucina®, the Roman Goddess of Childbirth. That's pretty interesting to know. I learned that Juno Lucina is the Roman goddess of childbirth who safeguarded mothers and their newborn children. They have a 5% discount code right now on purchases. I learned that they carry other jewelry like bracelets too. I love the Harmony Bracelet. Juno has been around over a thousand years and is a protector. I had never heard of a Push gift before! What a great idea and so much better than flowers and the like! They have risk free 90 day return and very pretty jewelry! I learned that their Harmony collection is available in 14k white, yellow, or two-tone gold. The symbol dates back 1000 years. they have a signature drop earrings too! All the designs symbolize hands. I learned what a 'push present' is! I learned that all designs symbolize the hands of Juno Lucina, the Roman Goddess of Childbirth, cradling and protecting the head of both mother and child. I had never heard of a push gift before hearing of this company. I learned that they also carry jewelry sets. I learned what a push present is. I learned that if you want a larger diamond than what they have advertised a concierge will help you with a custom piece. they have a page that explains push presents. Juno Lucina protects both mother and newborn. They have 30 years of experience in the creation of luxury jewelry. They have push presents, which I never heard of before now. Interesting. Learned what a push present was- show appreciation for the whole pregnancy experience that a woman goes through- Great idea! Learned the name Lucina, of Latin origins meaning light, refers to "she who brings children into the light of the world for the first time." Learned that they will also make custom jewelry in larger carat weights or other stones. The symbol of Juno Lucina has been around for a thousand years as has the concept of a push gift. Juno Lucina, the Roman goddess of childbirth, safeguarded mothers and their newborn children. They selling earrings that match their necklaces. I learned that this custom has been around for more than 1000 years. That they offer a Risk Free 90 Day Money Back Guarantee. All the designs symbolize the hands of Juno Lucina®, the Roman Goddess of Childbirth! i learned that Juno Lucinia is the Roman Godess of child birth,learn something new everyday!!! I learned that the Juno Lucina Signature Pendant is their best seller. I learned lucinda is the goddess of childbirth. I learned that Juno Lucina is actually the goddess of childbirth. I learned that the Roman Goddess Juno Lucina has been around for 1000 years and is the goddess of childbirth. I learned that The symbol of Juno Lucina has been around for a thousand years as has the concept of a push gift. Juno Lucina, the Roman goddess of childbirth, safeguarded mothers and their newborn children.